There was a nature preserve in Texas where I used to spend a lot of time. I would go and spend several hours hiking or just sitting under the trees, sort of a mini nature retreat. Besides just enjoying being out in nature, there were times when I had major revelations while in that place. One of these revelations happened one time when I was in the middle of a period of deep realization of the web that connects everything that exists. It’s an intriguing thing to contemplate the fact that there are “cords” of light or energy that connect everything to everything else; people, plants, animals, rocks, the sun, all connected together, all one. I was walking down the trail, thinking about these things rather than paying attention to what was around me. Suddenly, on the trail about 10 feet ahead of me, I saw three lizards. 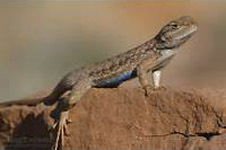 Now, these lizards are very common out there, but often you don’t actually see them as much as you hear the dry grass rustling as they run away. You can get a glimpse of them sometimes, but they’re usually hiding in the grass, and they won’t normally let you get within 10 or 15 feet before they take off. And they sure don’t stand out in the open while you walk toward them! So there they were, standing on the trail ahead of me, but I could tell immediately that something was wrong. I thought I had come across a fight or something, and they were reluctant to run away from me because they were in a standoff with each other. They would start to move and then stop, one way and then another, stop and start, very indecisive. I finally decided that they weren’t fighting, but then I thought maybe they had been poisoned by something, because their behavior was definitely not normal. Most of all, they weren’t running away. Then I saw another one walk up onto the trail and stop. Not only did the first three not run away, but now there was another one! They were all just looking around, and seeming very anxious. It was a conference of very confused lizards! And then, one of them started coming toward me. I felt like he was going to make a run for it, and he had for some reason decided that the best way to go was right past me! But, again, he couldn’t make up his mind: start, stop, start, stop, look all around, start, stop. Finally he ran past me, very close to me, and stopped a few feet behind me. Finally, he took off down the trail and disappeared into the grass. The others were still walking around nervously on the trail in front of me, and I began to walk slowly toward them. Haltingly, they scattered into the grass, and I continued on my walk. I hadn’t gotten 15 feet, though, when I saw another lizard sitting at the edge of the trail ahead of me. This one didn’t have the nervous behavior of the others; he stood there and watched as I walked right past. I got about five feet past him, and he was still standing there watching me, so I stopped and turned around. I began to talk to him; I asked him to come to me, told him I wouldn’t hurt him, and I would be so pleased if he would come and talk to me. Imagine my shock when this lizard began walking toward me! Not anxious and jerky like the others, but directly toward me. He stopped about two feet in front of me, and just stood there. This little creature, about 6 inches long, whose nature is to run away from beings like me before he can even be seen, had just walked up to me at my request! Slowly, I squatted down, which of course means that my “giant” head was even that much closer to him! He just stood there and looked at me. I was absolutely in awe! For a couple minutes, we just looked at each other. I talked, I guess he listened… If he talked back, I didn’t hear it. Finally, I stood up, and when I did, he ran off. Now THAT was definitely the high point of all my visits to the preserve! 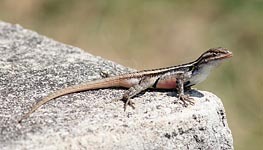 I didn’t see any more lizards on that particular trip, and on subsequent visits to the preserve, every time I saw one, it was just a quick glimpse as they disappeared into the grass. I figured maybe there was only one “lizard miracle” allowed per person! After we moved to North Carolina, we were visiting at a house in a rural area around Marion. We were checking out an old barn on the property, and I came across a different kind of lizard, hanging out on the side of the barn. When he saw me, he darted into a crack between the boards, and watched me from the safety of his hiding place. I immediately thought about the lizards at the preserve in Texas, and tried to get back to that same feeling of “connectedness” that I had felt at that time. I was standing probably about 6 or 8 feet from the lizard, a couple feet from the wall he was in, and I began to talk to him, and asked him to come closer to me. The boards of the barn were horizontal, and he began to creep toward me, staying inside the crack! This was pretty exciting stuff! He was about at eye-level with me, and he crawled right up to where I was, but still stayed safely hidden between the boards. So I said, “You know, I can’t see you very well, with you back in there. Why don’t you come out where I can see you?” HE STUCK HIS HEAD OUT! I couldn’t believe it! I leaned in toward him, and was able to get about a foot from him, before he ducked back to safety. We looked around the barn for maybe 15 minutes, and the lizard kind of hung out on the wall. He mostly stayed between the boards, but stuck his head out on one occasion, like he was looking at us. I can imagine all of these lizards, when the “weird giant” has left, and the energy’s returned to normal, shaking their heads and wondering, “What in the world was I thinking?” I don’t really have any idea what was going on in their heads, but when I have an encounter like that with any wild creature, it really fills me with awe and appreciation, and so much gratitude that I’m able to have experiences like that!